This photograph was submitted to the LNWR Society earlier this year with a request for information. The engine was identified by Harry Jack as originally a Lancaster & Carlisle 'Crewe Type' 2-2-2 built by Rothwell, the name Lazonby being that of the house of an L&C director, Mr. H.D. Maclean. Other L&C engines named after directors' houses were Rickerby and Dalemain, as was Bevere on the LNWR, the house of Sir Richard Moon, pronounced, by the way, to rhyme with 'reverie'. More difficult is the location of the photograph. At first, Chester was suggested but then rejected. Next the original enquirer stated: "I have been in contact with Gordon Wood who has written a book on the history of railways in Hereford. He states that the photograph was taken outside the engine shed at College Road, Hereford, which was built in the 1850s by the Shrewsbury & Hereford Railway then used by the LNWR, followed by the LMS. It was demolished in the 1960s." Committe discussion to date is summarised here. I think this is Hereford LNWR shed, as might be suggested by the Hereford photographer's name on the mount and as confirmed by Gordon Wood. Unfortunately the earliest Ordnance plan was surveyed in 1885/6 - rather later than the date of the photograph - but it shows five tracks including some pointwork along the west side of the shed, which is compatible with what can be seen in a larger print of the 'Lazonby' photograph. The shed was about 100ft long by 45ft wide, containing three tracks. A photo in Hawkins & Reeve LMS Engine Sheds vol 1, p241, shows the north end of the shed in 1935. The brickwork looks similar - presumably the S&H style - but the roof has separate smoke outlets instead of the central roof ventilator. This difference might be explained by the roof having been "nearly all ripped off" in a gale in 1877 and the subsequent fitting of smoke troughs with which the shed had not previously been provided. (SLS Journal, 1960, p89). 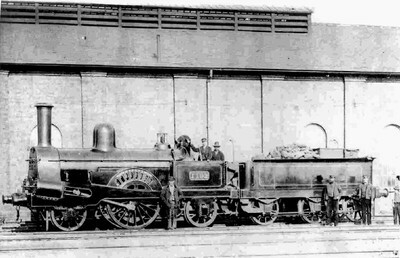 The photograph of GWR no. 1009 seems to have been taken at the same spot but, from the different details of the pulleys and signal(?) wires along the shed wall, on a different day, and perhaps months or even years later. The 'Lazonby' photograph can be dated definitely to 1873-9 (engine number, chimney, livery) but if it was at Hereford it would presumably have been taken before the gale of 1877 destroyed the roof.